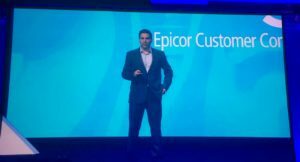 Steve Murphy, CEO, Epicor kicked off the Epicor Insights 2018 conference with several announcements. These should help Epicor in the months and years ahead in the competitive mid market. There is a new management team in place following the acquisition by KKR and Murphy has the reins. Some of the bets placed by CTO Himanshu Palsule are now coming to light and Murphy has also had an influence in more recent decisions. The key announcements were around a new UX framework, new partnerships and a new Alliance ISV partner program. Each of these announcements complemented each other. That platform is the Epicor Kinetic Design common cross platform UX framework. Announced at the convention it will only go into a pilot phase in June. In a later release this year the Epicor E10 home page will use the framework. This will be followed by general availability in 2019. Other areas of Epicor systems will also get the Kinetic treatment though it is unclear when that will occur. The framework consists of three elements Epicor Kinetic Design, Epicor Kinetic Framework and Epicor Kinetic Applications. Epicor Kinetic Design: A set of new user experience guidelines and patterns for building applications for Epicor solutions. Delivering unified colors, typography and icons, user interface (UI) elements, and page layouts, Epicor Kinetic Design empowers partners to deliver value-added solutions consistent with Epicor usability best practices and interaction guidelines to enhance customer experience. Epicor Kinetic Framework: It embodies Epicor Kinetic Design principles and lives as a website accessible by approved Epicor partners and customers. They have access to sample code and tutorials, a UI component code library, API documentation, and actual code, all with web native and responsive design—working seamlessly on desktop, tablet, or mobile. Kinetic is not a NoCode/Low Code environment. However, the intention is to eventually become one. At the moment it is clear that while the platform is ready for beta it is still a first iteration. A small change in the code is immediately reflected across any device. However customers/partners will still need developers to create the code. In time though this could change, especially for the creation of simple apps. Kinetic is more than just a UX/UI framework. It the framework of a platform that will allow customers and partners to create apps for Epicor users to utilise. To encourage that Epicor also announced some infrastructure to support that. Good things come in threes. Epicor also announced a new Alliance ISV Partner Program, Solution Gallery, and Developer Hub. The new partner program will support ISV’s from the scoping of an idea to the certification of the application on the Epicor platform. Partners will receive information and support during their product creation process. ISV’s can take advantage of a developer hub, training, certification and marketing support for their final product. Once applications are certified they will appear on the new Epicor Alliance ISV Solution Gallery. There are currently 20 applications listed including one created in partnership between Epicor and Seagull Scientific, BarTender. Another new solution is Epicor Field Service Automation. Developed in partnership with Hitachi Solutions it is the official Epicor FSM module. On the new alliance program, Scott Cone, vice president, Hitachi Solutions America, Ltd commented: “The new Alliance ISV hub provides us a centralized location that encompasses our partnership across the business relationship, go-to-market strategies, development, and quality analysis. Having access to the latest ERP code base, API tutorials, the online help, user guides, and training will allow us to easily onboard new developers to continue making this partnership a success.”. In addition to creating more partnerships with ISV’s, Epicor is also looking to extend their list of strategic partners. Murphy revealed on stage the strengthening of the strategic partnership with Microsoft. There is a commitment to move the Epicor solutions to the Azure cloud and to leverage the entire set of Azure technologies in time. Those technologies include IoT, AI and Machine Learning. Epicor ERP is nearly migrated and will be available soon. This year will also Prophet 21 migrated to Azure and the retail offering will be transferred sometime after that. Eagle N and the forthcoming Retail Cloud are currently on AWS and there seems some doubt as to whether it will eventually move. In a recorded Video Message Satya Nadella, CEO Microsoft confirmed that the relationship is with Epicor Manufacturing and Distribution, and that Microsoft support a hybrid cloud environment. Whether that hybrid will involve Amazon, one of their toughest competitors, only time will tell. Murphy commented: “Microsoft’s focus on the ‘Intelligent Cloud’ and ‘Intelligent Edge’ complement our customer-centric focus. We looked at several public cloud options. Microsoft Azure offers the best foundation for building and deploying enterprise business applications that will enable our customers’ businesses to adapt and grow. The second announcement was with the integration platform Jitterbit. This should help Epicor to create connections to third party software. Some of these will be valuable even before they integration their software. The partnership allows Epicor to connect to any application that is supported by the open API architecture of Jitterbit. As an API integration platform it will enable Epicor to connect to a wider set of software. This may make it easier for Epicor to bid in two tier ERP situations where integration to SAP, Oracle or even Workday financials is important. Thierry Bonfante, vice president of global product management, cloud, Epicor Software commented: “In the cloud, it’s not about individual products anymore, but rather about value added business services that cross historical application boundaries and tap into a very broad set of data. For Jitterbit this is another vindication of its strategy of vendor neutrality to offer the greatest number of integrations. With Mulesoft now tied to Salesforce through integrations such as these it may allow Epicor and Jitterbit to reach a broader market. Epicor still has a way to go, but it has shown that it has taken the first steps in the right direction. When Kinetic is launched it will bring a welcome refresh to the US. If Epicor can persuade ISV’s to the platform then this will be a significant boost to the business. There are still some unanswered questions about where the Microsoft deal leaves AWS. Also with 72 products in play Murphy indicated that there might finally be some gradual sunsetting. This will also, hopefully, come with offers of assistance to help companies off the legacy software. Next articleWhat is Cloud in 2018?